Aren’t these annuals supposed too mean something? In the mid-90s, you had epic epics spanning across multiple titles and things like trading cards and death and shake-ups to get you buying more. This kind of thing wants me to buy a log so I can saw it. There’s an interesting start to things where some kid (turns out it’s Franklin Richards) is having this dream about the Man in the Moon. Turns out the dream is about Quicksilver whisking Franklin off to the moon, but really, that’s about as good as it gets here. There’re too many characters, too much exposition, and too much talking. Knowing what I know now, Jo Duffy was at the helm for this one, of he of Fallen Angels fame. Snore. There’s some bickering between kids. There’s some bickering between Scott and Jean about Phoenix. It’s as if they took the decent writing of Simonson and handed it over to Duffy because they were getting Cyclops and Jean Grey back together again and Simonson didn’t want any part of it. 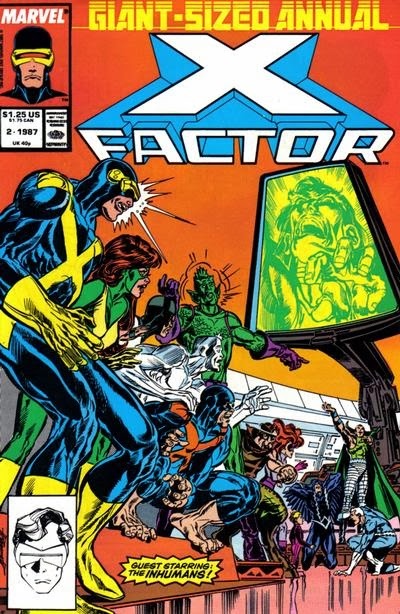 Sad this is the last of the X-Factor issues.